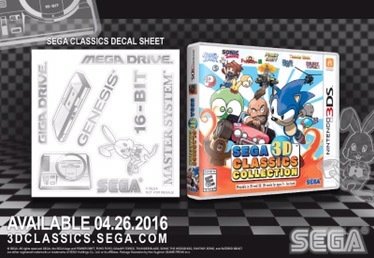 With Sega 3D Classics collection launching in April Sega announces first run or launch editions of the games will come with Sega themed decal stickers in which you can use on your 3DS. Master System logo — Originally released in 1985 as the Sega Mark-III in Japan, the Master System was redesigned and renamed when it launched in North America in 1986 with an added FM Sound Unit. Master System console — An authentic line-art likeness of the North American/European version of the console! Mega Drive logo — Originally released in Japan in 1988, the Mega Drive was the 16-bit successor to the Master System. Widely considered one of the greatest video game consoles of all time, the system was home to many classic games such as Altered Beast, Sonic the Hedgehog, and many more. Genesis logo — Please choose a “Blast Processing” joke to your liking. Are we good here? Genesis console — An authentic line-art likeness of the Model 1 SEGA Genesis console! Professor Asobin -Before Sonic, Alex Kidd, and Opa Opa, this dapper white rabbit appeared in most SG-1000 game manuals and gave helpful advice to players. Although he was briefly replaced by Dr. Games, he soon returned and appeared in game manuals up until the Mega Drive/Genesis era. SEGA logo – A SEGA decal collection wouldn’t be complete without the company logo! Sega 3D Classics Collection launches April 26th.